What happens when you pit the funniest man in India, against the biggest trickster known to mankind? Fireworks and crackling chemistry, of course! And that’s exactly what was witnessed in the battle of wits between Arshad Warsi and Brian – the ‘Brain’ mascot, when Arshad came on board the Nat Geo journey, as the face of the channel’s latest snacky, infotainment series, ‘Brain Games’, premiering on March 3, 2014. 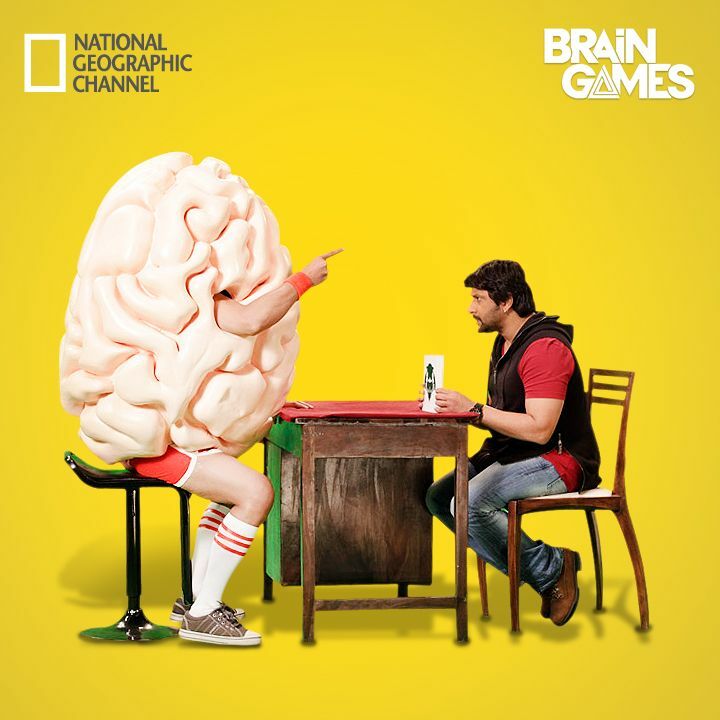 With the launch of ‘Brain Games’, Nat Geo is furthering its endeavor to deliver intelligent content in an interactive & witty manner, thus providing ideal food for the brain. ‘Brain Games’ uses an intricate string of mind-boggling experiments, optical illusions, brainteasers and hard science, to size up the ever-fascinating human brain. And when there’s a Nat Geo launch in the offing, how can one expect anything short of ‘out-of-the-box’? To drive home the messaging of the show in a more visual, interactive manner, the channel has introduced a mascot called Brian – the ‘Brain’, an actual 2-meter tall brain with limbs. So when actor and comedian extraordinaire Arshad Warsi jumped aboard, for this exciting ride with Nat Geo, the most obvious way to introduce him to Brian, was by testing his inimitable comedic timing against Brian’s wit. Premiering on 3rd March at 9 PM, ‘Brain Games’ will be delving into topics like focus, fear, persuasion, decision-making and neural fitness, to turn your mind’s eye inwards for a profoundly entertaining and revealing journey into the three and a half pounds of tissue that makes you…you!